Kath Carter, living proof that ordinary folk can do extraordinary things..
Church Action on Poverty’s experience over the last 30 years has proved again and again that people with personal experience of the effects of poverty on their lives and communities not only understand its root causes, but are highly effective at creating lasting solutions to the problems they face. Our task is to empower people to make change happen for themselves. Over the last 30 years, Church Action on Poverty has worked alongside hundreds of people from some of the UK’s poorest, most neglected communities, supporting, educating and empowering individuals to effect change from within, impacting on the lives of tens of thousands of people across the country. 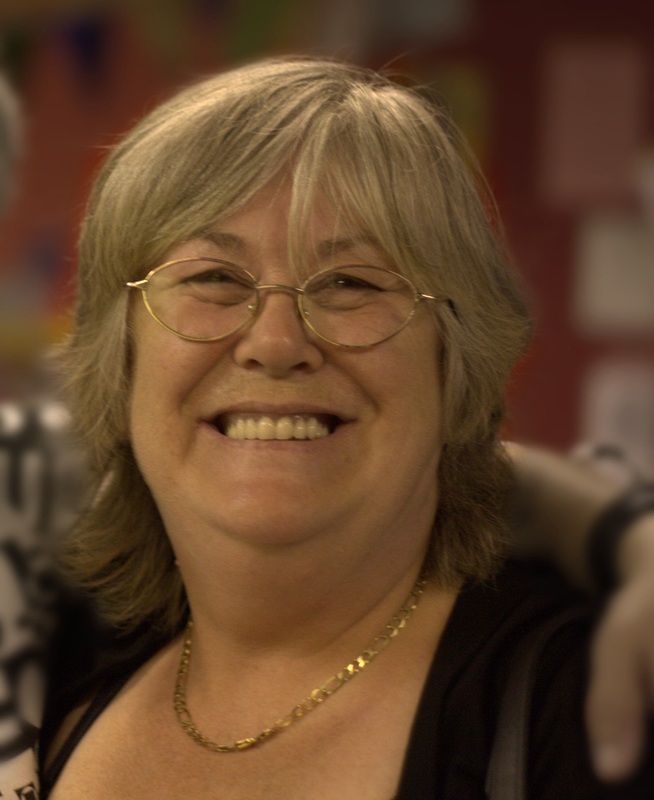 Through Church Action on Poverty’s Changemakers programme, Kath has trained as a community leader. She has been trained to be powerful. Last year, with others involved in Thrive, Kath uncovered huge dissatisfaction amongst customers with the actions of a high cost lending company, Buy As You View (BAYV) – high credit charges, poor customer service, lack of transparency in what customers owed and so on. Based in Cardiff, BAYV sells TVs and other household appliances to over 100,000 people, and something of a poor reputation for customer service. Most local projects would respond by encouraging customers to get help from the local CAB and seek redress on an individual basis. Not so, Thrive. Having been trained in Community Organising, Kath’s response was to seek to challenge the way the company itself operated – at the very top – by seeking a meeting with the boss of the company, Graham Clarke. With assistance from our project local worker, Kath and colleagues produced a spoof TV advert for BAYV highlighting the issue, which was watched by over 1,000 people on YouTube. CAP supporters in churches across the country then emailed and telephoned Mr Clarke, politely demanding that he meet with Thrive to respond to their concerns. Finally, result, Graham agreed to fly his senior management team from Cardiff to Stockton, to meet with Kath and six of his customers. Having in Graham’s words ‘thrown rocks at him’ to get him to the meeting, far from finding confrontation, he accepted the concerns of some of his most long-standing customers, and acceded to all of Thrive’s demands. Not only that – he agreed to work with Thrive to bring together a roundtable of high cost lenders along with the Office of Fair Trading to find a way forward. This roundtable, chaired by the Bishop of Ripon, has spent the past few months developing an industry wide code for responsible lending, which when it is signed, will benefit up to 325,000 customers of high cost lending companies. People power does work. The power of ordinary people; trained, encouraged and supported to challenge the practices of powerful institutions in society; to reclaim power. People freed from the shackles of thinking that they are worthless, powerless victims in structures and systems beyond their control. People freed from the idea that they are ‘problems’ for others to fix. Liberated. So do our churches offer liberation? Do we offer liberation, or simply spiritual succour, tea and sympathy for hapless victims? Do we engage with and empower the Kaths in our own communities to become agents of change and transformation? Do we inspire in our members and others the belief that another world is possible? How powerful would our churches be, if we became agents of liberation in our communities? If we inspired in our members and in the wider community a belief that change is possible. And if we acted with others – locally and globally – as a powerful movement for change? Niall, This is a fab piece. Thank you for it. It reminds me of this ( below ) from my Bible Tutor’s upcoming book…. The thing is that (1) most folk didn’t get into Christianity for this sort of thing but for the touchy-feelly stuff, and (2) those of us who did ( get into Christianity for this sort of thing) find we’re just not up to the job… But please keep at us!